Welcome to another edition of the All Vampire Book and a Movie Challenge! 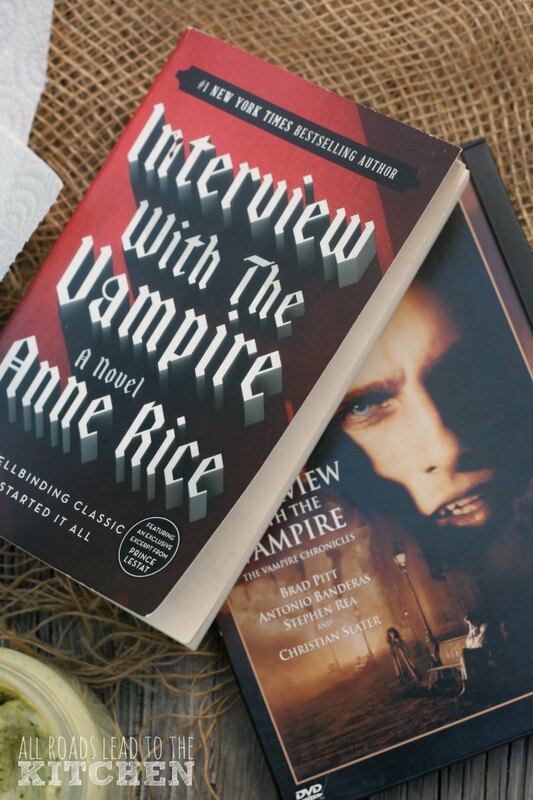 Our pick for June was Interview with the Vampire the book by Anne Rice and movie adaption, its screenplay also written by Anne Rice. Before this month, I only remember watching the movie in its entirety once, probably 20-ish years ago, around when it was released. Over the years I've caught bits and pieces on tv every once in a while, but I knew it would be like seeing it for the first time when I sat down to watch it again. This was my first time reading the book (or any of Anne Rice's books, actually). Divided into 4 parts, this story begins in modern day. Louis, a 200-year old vampire is about to tell his story to a reporter (referred to as "the boy" throughout the book). His vampire life began in 1791 in his hometown of New Orleans. A plantation owner who cares for his mother, sister, and younger brother, he becomes distraught after the death of that brother who he "believed to be a living saint". Feeling guilty over his death, he's lost the will to thrive, and his choices began to show that. He "lived like a man who wanted to die but had no courage to do it himself", passing out in cabarets, walking dark streets and alleys alone and wishing to be murdered until one night he was attacked by a vampire named Lestat. Lestat, a lone vampire in the area looking for companionship, had his mind set on Louis as that companion...and a remote home and wealth, both of which Louis possessed. But as wild and uncaring as Lestat was, Louis wound up being his polar opposite. He considered himself a monster and hated taking human life, drinking mostly from animals while Lestat took human lives left and right. One night Louis stumbled upon a child of five years old, crying next to her dead mother's body (she had died of the plague), and was so drawn to her that he drank from her and almost killed her. Lestat happened to see what he had done and got a huge kick out of witnessing "Saint Louis" lose control. Feeling he was going to lose Louis, Lestat went back to find this child, Claudia, the next night and found her in an orphanage, near death. He brought her home as a gift for Louis, who felt that same "pull" to her and drank until there was nothing left. As was his secret plan, Lestat turned her into their "vampire child", Louis cursing him for doing so. I don't want to tell the whole story (mostly because it would take far too long), but that's just a little ways into Part 1. Part 2 takes place in Europe, Part 3 in Paris, and Part 4 takes place after the death of Claudia, circling back around to modern day New Orleans. Although I liked the story as a whole, I thought parts of it dragged and it took me longer than it usually does to finish a book...though most of the slow parts were in Part 1, which was the entire first half of the book. Also, there were some semi-uncomfortable moments that took place around the love between Louis and Claudia, because although her body was that of a five-year old, her mind was ancient. As far as food goes, there wasn't a lot, but it was present, along with plenty of alcohol (which is almost always the case in the vampire novels I've read so far). With the majority of the book set in New Orleans and Louis being Creole, that really stuck in my head. But the food and drink actually mentioned by name were: wine, sugar, orange blossoms, herbs, Champagne, steaming cups of chocolate or tea, lavender, brandy wine, absinthe, winter plums, bananas, the "sweet smell of spices and the fresh green of marjoram and bay", cooking meat, broth, peaches, and fish. Okay, that's kind of a lot. While it had a lot in common with the book, and you can tell it was the basis for the story, a bit was changed and much was left out. For reasons I can't comprehend, the interview takes place in San Francisco instead of New Orleans, though the story Louis tells does take the viewer back there. Instead of the loss of his brother leading him to depression, it is the death of his wife and child. Claudia is a bit older in the movie than in the book, but she and Louis still have good chemistry. The Europe portion of the story is left completely untold. The portion of the story set in Paris comes fairly close, though I did not like Antonio Banderas in the role of (fair, red-headed) Armand, and thought he and Louis had zero chemistry in the movie. I liked Brad Pitt in the role of Louis and the very young Kirsten Dunst as Claudia...and surprisingly, also liked Tom Cruise as Lestat. While I was tempted to not like it since so much was changed from the book, I actually was able to look at them as two separate entities (which is hard for me to do)...and enjoy both. There was even less food mentioned in the movie, though there were some great visual moments. Seen or mentioned were: mugs of beer, wine, brandy wine, absinthe, ham (or some type of meat), grapes and some other fruit, and crawfish. As I mentioned earlier, when it came to food inspiration, it was all about the Creole aspect of both the book and the movie for me. 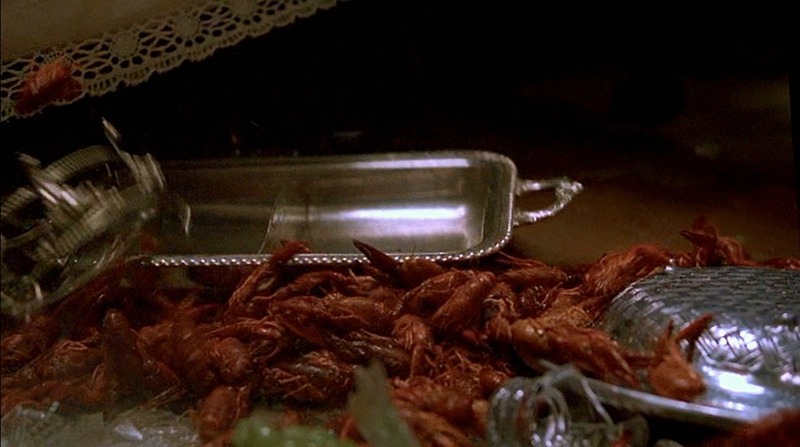 Both had nods to Creole heritage and food, so along with a quote from each source, there was a platter of crawfish knocked from a table in the movie that wound up being my ultimate inspiration. "He was gone by this time, really, but there was in me that great desire to see Europe and to know it, which comes not only from the reading of all the literature and the philosophy, but from the feeling of having been shaped by Europe more deeply and keenly than the rest of Americans. I was a Creole who wanted to see where it had all begun." "Oh what I wouldn't give for a drop of good old-fashioned Creole blood." Now, I've also been a bit obsessed with New Orleans lately, pouring over photographs, stories, music, movies, and tv shows centered around it. It's been at the top of my "must visit destinations" list for years and recently I started thinking about it again (even before this month when I realized the main part of Interview was set there). A few months ago, I started watching the HBO series Treme and then ordered a copy of the Treme Cookbook because I was obsessing a bit. 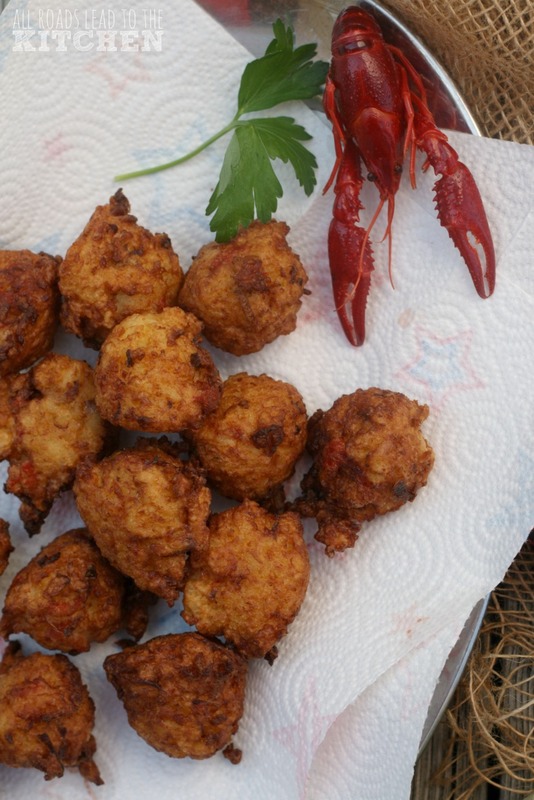 I've already made a couple of things from the book, and I'd bookmarked a recipe that I thought was exactly what I wanted to make to represent Interview with the Vampire—Crawfish Calas. Traditionally, calas are a Creole fried rice fritter that's been dusted with powdered sugar and eaten for breakfast. 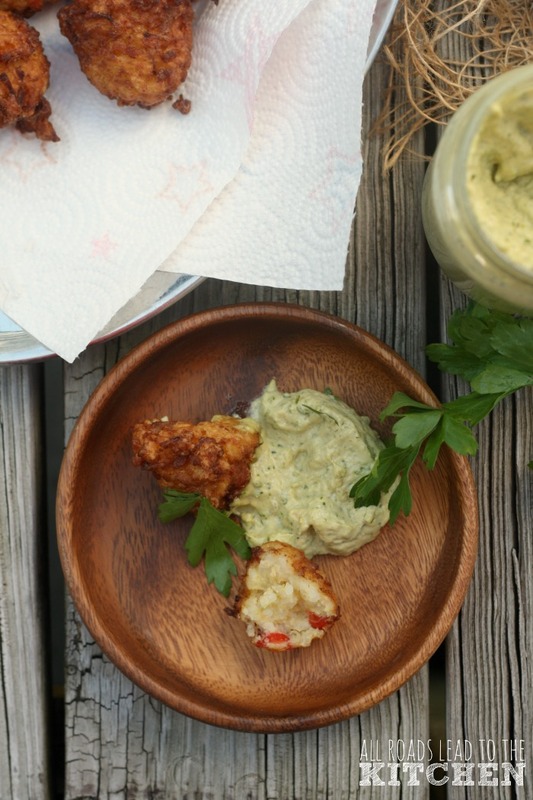 These are a savory twist studded with chunks of crawfish (from the movie) and thinly sliced green onions, and the homemade green garlic mayonnaise (herbs and a kitchen garden were mentioned in the book) is the perfect bold accompaniment for dipping them in. 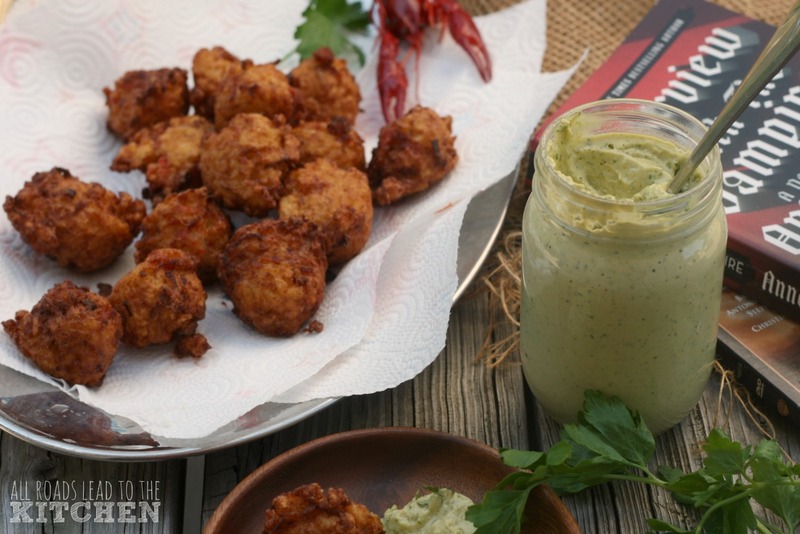 A savory spin on the Creole favorite, these fried rice fritters are studded wtih chunks of crawfish and served with a homemade green garlic mayonnaise. Place the garlic and green onion in the jar of a blender (or food processor) and pulse to chop. Add the egg and lemon juice, pulse again to blend. With the machine running, slowly drizzle in the olive oil until thick. Add parsley, ketchup, and salt and process again until well-blended, ~1 minute. Pour and scrape the mayonnaise into a jar or bowl; cover and refrigerate for at least 2 hours before using (it will get thicker in the fridge), or up to 5 days. Combine the rice, flour, baking powder, and salt in a bowl and stir until everything is combined and the individual rice grains are coated in the flour mixture (I find it works best to use your hands). Push the mixture to the side and add the eggs to the open space. Beat them lightly with a fork and then add the crawfish and green onions and stir everything together until evenly combined. Pour a depth of about 3-inches of oil into a pot for frying. Clip on a deep-fry thermometer and let the oil come to 360° F. In the meantime, line a plate with a couple of paper towels and set aside. When the oil is ready, scoop 2 tablespoon portions of the batter into the hot oil, taking care not to crowd the pan (do it in batches) and fry for about 2 to 3 minutes total. If you have deep enough oil, the calas should flip themselves during frying, but if they don't, use a fork or slotted spoon or spatula to carefully turn them over halfway through baking (or use a deep fryer or fry basket like the Copper Chef pan you see in the photo above). 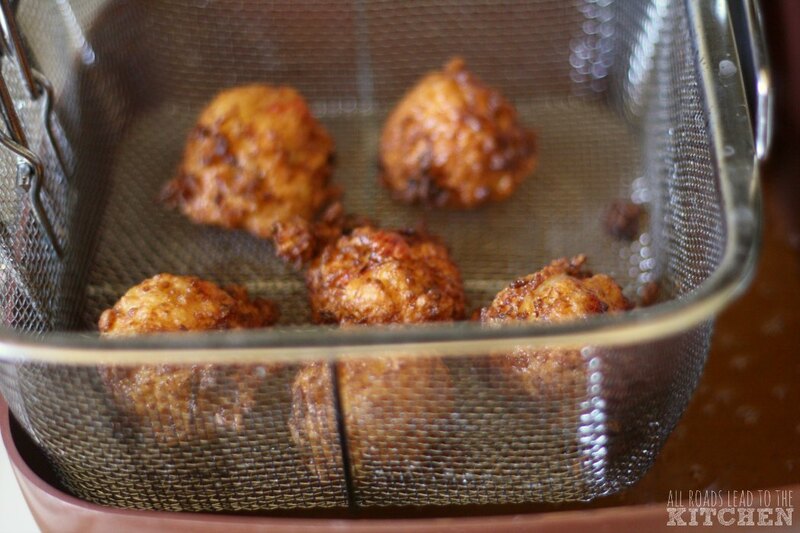 Lift the fritters out of the oil and transfer to the paper towel-lined plate. 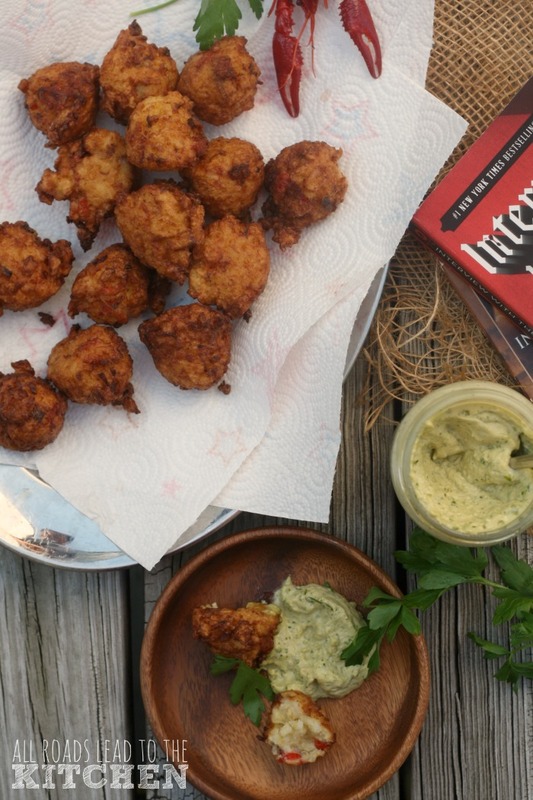 Repeat until all of the fritters are fried. 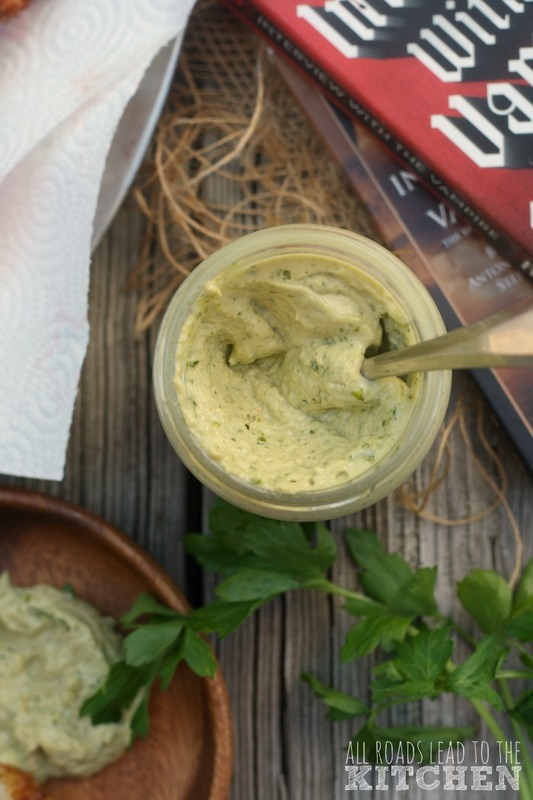 Serve hot with the homemade mayonnaise for dipping. 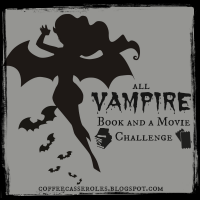 The All Vampire Book and Movie Challenge is hosted by Kimberly at Coffee and Casseroles, and meets monthly to discuss a predetermined book and movie relating to vampires. Sometimes the book and movie may be the same (or an adaptation), others they may relate in a more obscure manner. Once we've read the book and watched the movie, we write a blog post discussing them and how they relate or differ, and perhaps share something that it inspired us to make. This month's assignment was Interview with the Vampire (book and movie). If you'd like to join the discussion next month, we'll be reading Carmilla by Sheridan Le Fanu and watching Hocus Pocus, and our posting date will be Sunday, July 31st. Until then, let me know if you'd read this book and/or seen the movie - and what you thought about either. Also, drop by and see what Kimberly thought of the book and movie, and see the recipe she was inspired to make here!